The Oklahoma City Thunder have reached agreement to sign veteran guard Derek Fisher for the remainder of the season, league sources told Yahoo! Sports. Fisher arrived in Oklahoma City Sunday night and will sign his contract on Monday. Fisher, 38, signed with the Thunder late last season and helped Oklahoma City make its push to the NBA Finals. 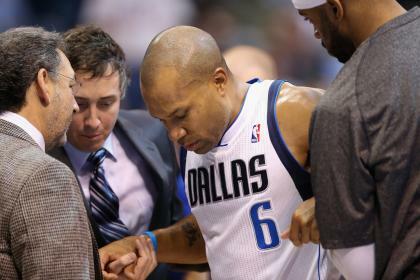 He joined the Dallas Mavericks early this season and played nine games in December before suffering a knee injury. He asked the Mavericks to release him, so he could spend more time with his family. The Thunder have room for another guard after trading Eric Maynor to the Portland Trail Blazers on Thursday. Reggie Jackson is receiving most of the backup point guard minutes behind Russell Westbrook. Fisher joined the Thunder last March after the Los Angeles Lakers traded him to the Houston Rockets and he negotiated a buyout. He averaged 6.3 points and 1.3 assists in 20 playoff games for the Thunder last season. Fisher has remained president of the National Basketball Players Association, which recently ousted Billy Hunter as its executive director. ESPN.com first reported that Fisher was close to the signing with the Thunder.